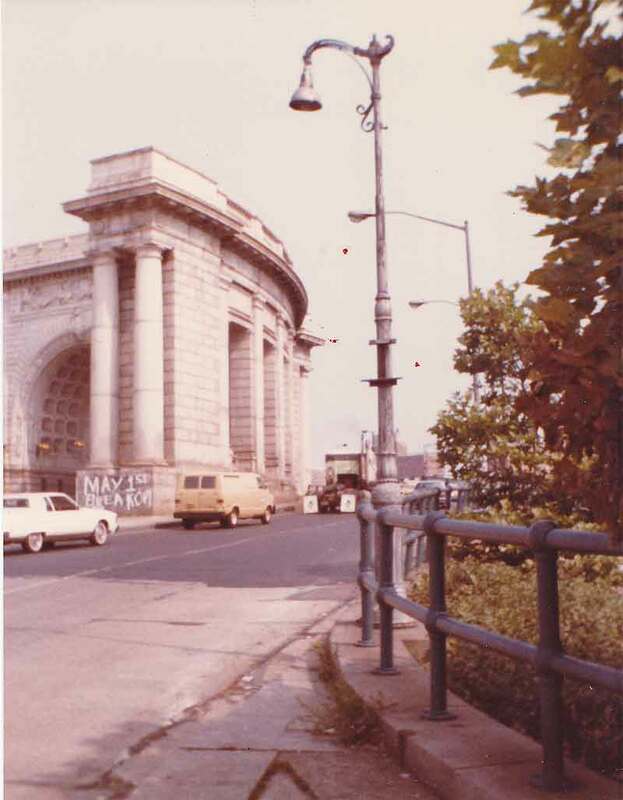 Until recent years, when a final reconstruction of the Manhattan Bridge Manhattan entrance was done, a rare collection of old cast iron lamp post specimens remained along side the Brooklyn bound lanes. In 1982, when these photos were taken, they all sported the silver paint scheme occasionally employed in special areas like beaches, or on certain main thoroughfares, as opposed to the usual brown paint used on cast iron poles across much of the city. This bishop crook style post wears a Bell shaped pendant luminaire dating from the 1930s or 1940s. The stick like thing attached to the top of the curved mast is a photo cell switch controlling the light fixture, added only a few years prior. The second of the crazy quilt cast iron collection was a small Type F reverse scroll style pole, of which many appeared on side streets until the 1960s. Larger reverse scroll posts were known as 7th Avenues as that north-south Manhattan thoroughfare was their special spot. The last New York City roadway to retain more than an oddball survivor such as this lone pole, was Rockaway Boulevard, way down yonder in Rosedale, Queens, where that road passed along side Kennedy Airport. Until well into the 1970s, little mini me versions of the Type F, both single and twin armed, dominated the boulevard where it crossed beneath the flight paths to and from the eastern runways. By 1982, when I shot this, few survivors of the reverse scroll remained anywhere within New York City. Those that did were usually on forgotten walk bridges, such as one bridge spanning the Belt Parkway in Dyker Heights, Brooklyn. Rounding out the well rounded collection of cast irons was a Type G/M24 lamppost, with a long, straight mast arm braced by detailed scroll work. Upon doing my first street lighting site back in 1996, I came upon a catalog from a firm I can't remember, that featured a similar styled pole for decorating a front yard or driveway. They named their model the Corvington, and for lack of anything better to use, I nicknamed the Type G's and their similar styled brethren Corvingtons. Among other street light mavens, the name spread and that's pretty much how these are labeled today. 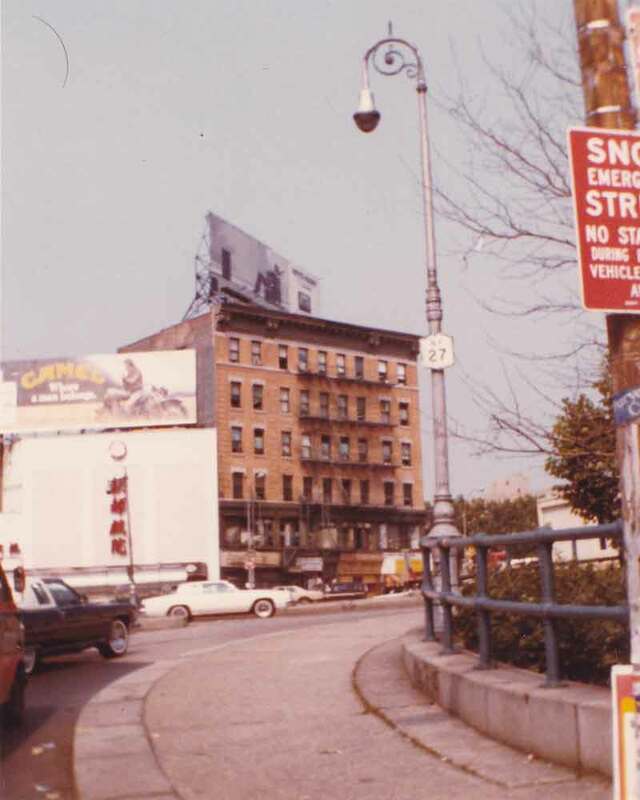 The prior photo faced westward down Canal Street, towards the heart of Chinatown. 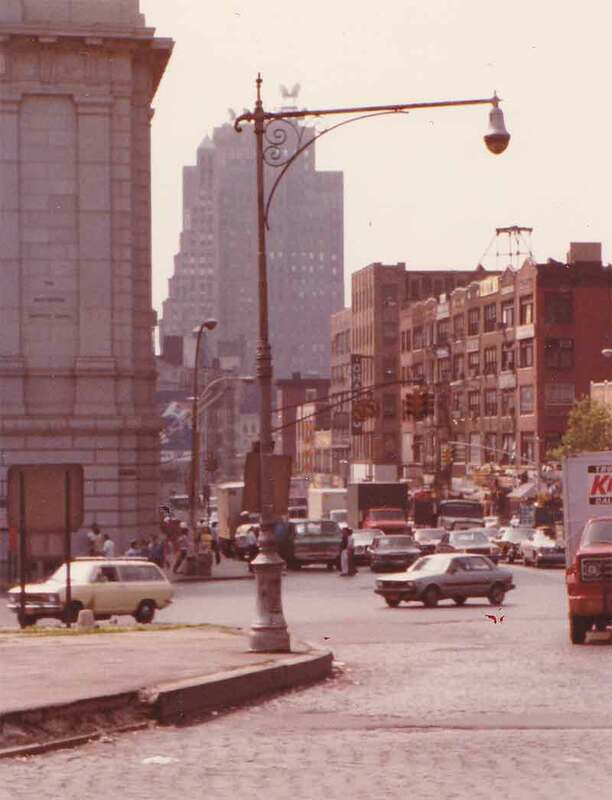 This view faces northward up the Bowery, which eventually feeds into 3rd Avenue. Like the bishop crook post, this Corvington has the Bell fixture. As the 1980s wore on, a blizzard of retro styled lampposts flooded many main arteries in the city, varying in their elaborateness and faithfulness to their historical models. While at first the trend seemed cute and nostalgic, eventually, for me anyway, it became tiresome, and pretty much ruined the joy of coming across previously unknown relics. With hundred of newfangled Corvingtons, sporting every imaginable style of scroll work, and even twin masts, their specialness dissipated. There can indeed be too much of a good thing, especially when badly needed tax dollars are paying for them. Needless to say, the retros are made of far sturdier, easier to maintain materials than cast iron. The retro efforts aren't always pretty either. For the Bell style pendant unfortunately, most retro fixtures fail miserably at evoking the original lines. 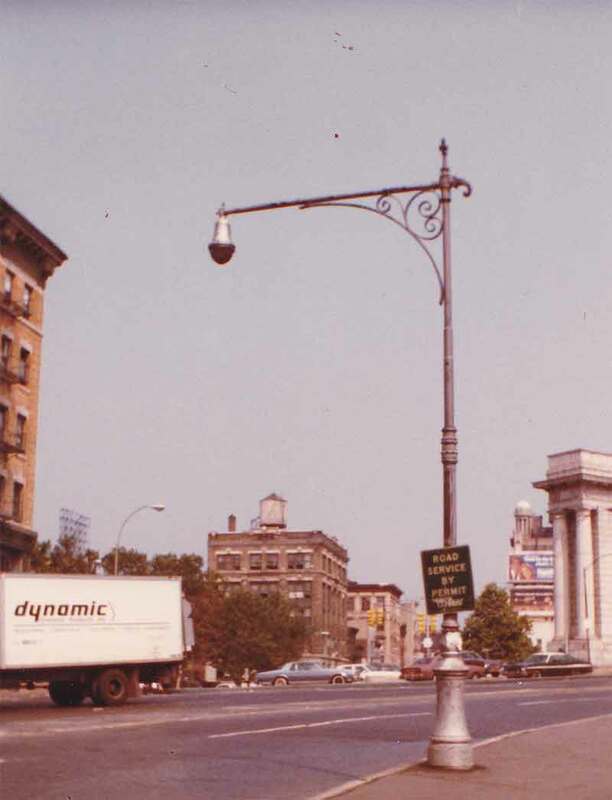 Some of the cheaper looking lamp posts are also fairly ugly, such as the hideous loops used on 14th Avenue to represent bishop crooks, or the straight masted horrors used on Flatbush Avenue and other main roads.